Send someone you know an invite! An arrhythmia is an abnormal rhythm of the heart. It may feel like a temporary pause and be so brief that it doesn't change your overall heart rate. Or it can cause the heart rate to be too slow or too fast. Some arrhythmias don't cause any symptoms. Others can cause symptoms such as lightheadedness or dizziness. 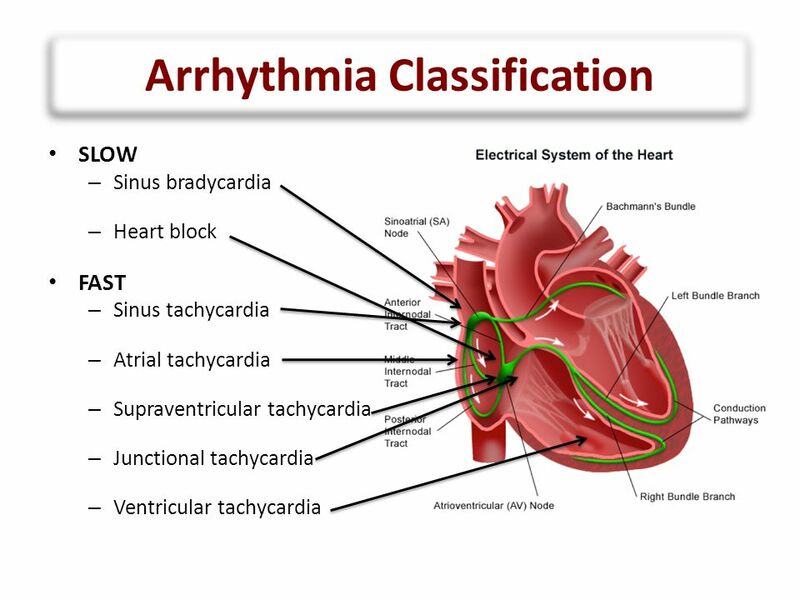 There are two basic kinds of arrhythmias. Bradycardia is when the heart rate is too slow- less than 60 beats per minute. Tachycardia is when the heart rate is too fast - more than 100 beats per minute. Premature atrial contractions. These are early extra beats that originate in the atria (upper chambers of the heart). They are harmless and do not require treatment. Premature ventricular contractions(PVC). These are among the most common arrhythmias and occur in people with and without heart disease. This is the skipped heartbeat we all occasionally experience. In some people, it can be related to stress, too much caffeine or nicotine, or too much exercise. But sometimes, PVCs can be caused by heart disease or electrolyte imbalance. People who have a lot of PVCs, and/or symptoms associated with them, should be evaluated by a heart doctor. However, in most people, PVCs are usually harmless and rarely need treatment. Atrial fibrillation. Atrial fibrillation is a very common irregular heart rhythm that causes the atria, the upper chambers of the heart, to contract abnormally. Atrial flutter. This is an arrhythmia caused by one or more rapid circuits in the atrium. Atrial flutter is usually more organized and regular than atrial fibrillation. This arrhythmia occurs most often in people with heart disease and in the first week after heart surgery. It often converts to atrial fibrillation. Paroxysmal supraventricular tachycardia (PSVT). A rapid heart rate, usually with a regular rhythm, originating from above the ventricles. PSVT begins and ends suddenly. There are two main types: accessory path tachycardia and AV nodal reentrant tachycardia (see below). Accessory pathway tachycardia. A rapid heart rate due to an extra abnormal pathway or connection between the atria and the ventricles. The impulses travel through the extra pathways as well as through the usual route. This allows the impulses to travel around the heart very quickly, causing the heart to beat unusually fast. AV nodal reentrant tachycardia. A rapid heart rate due to more than one pathway through the AV node. It can cause heart palpitations, fainting, or heart failure. In many cases, it can be terminated using a simple maneuvers, such as breathing in and bearing down, and others performed by a trained medical professional. Some drugs can also stop this heart rhythm. Ventricular tachycardia (V-tach). A rapid heart rhythm originating from the lower chambers (or ventricles) of the heart. The rapid rate prevents the heart from filling adequately with blood; therefore, less blood is able to pump through the body. This can be a serious arrhythmia, especially in people with heart disease, and may be associated with more symptoms. A heart doctor should evaluate this arrhythmia. Ventricular fibrillation. An erratic, disorganized firing of impulses from the ventricles. The ventricles quiver and are unable to contract or pump blood to the body. This is a medical emergency that must be treated with cardiopulmonary resuscitation (CPR) and defibrillation as soon as possible. Long QT syndrome. The QT interval is the area on the electrocardiogram that represents the time it takes for the heart muscle to contract and then recover, or for the electrical impulse to fire impulses and then recharge. When the QT interval is longer than normal, it increases the risk for "torsade de pointes," a life-threatening form of ventricular tachycardia. Long QT syndrome is an inherited condition that can cause sudden death in young people. It can be treated with antiarrhythmic drugs, pacemaker, electrical cardioversion, defibrillation, implanted cardioverter/defibrillator, or ablation therapy. Bradyarrhythmias. These are slow heart rhythms, which may arise from disease in the heart's electrical conduction system. Examples include sinus node dysfunction and heart block. ​What are the signs of arrhythmia? ​When it's very brief, an arrhythmia can have almost no symptoms. It can feel lie a skipped heartbeat that you barely notice. It also may feel like a fluttering in the chest or neck. Whwen arrhythmias are severe or last long enough to affect how well the heart works, the heart may not be able to pump enough blood to the body. This can cause you to feel tired or lightheaded or may make you pass out. It can also cause death. Tachycardia can reduce the heart's ability to pump, causing shortness of breath, chest pain, lightheadedness or loss of consciousness. If severe, it can also cause heart attack or death. ​Before treatment, it's important for the doctor to know where an arrhythmia starts in the heart and whether it's abnormal. An electrocardiogram (graphic record of electrical impulses​ made by the heart) is often used to diagnose arrhythmias. Using a Holter monitor, e​exorcise stress test, tilt table test and electrophysiologic studies ("mapping" the electrical system of your heart) are other ways to find where arrhythmias start. It's a way of returning an abnormal heartbeat to normal with a very brief electric shock. An implantable cardioverter defibrillator (ICD) may be placed under the skin of the upper chest to give shocks and/or work as a pacemaker. It knows when the heartbeat isn't normal and works 24 hours a day. ​It's a way to fix an arrhythmia and get your heart to beat normally. It's done by putting a thin tube (a catheter) in your vein and guiding it to the heart muscle. The tip of the catheter delivers a burst of energy that destroys very small areas of heart tissue that causes abnormal electrical signals. Electrolyte imbalances in your blood (such as sodium or potassium). Changes in your heart muscle. Injury from a heart attack. Healing process after heart surgery. Irregular heart rhythms can also occur in "normal, healthy" hearts.